RATCHABURI, THAILAND - MAY 10 2016 : Trader selling food on boats at Damnoen Saduak floating market . Damnoen Saduak is a very popular tourist attraction in Thailand. 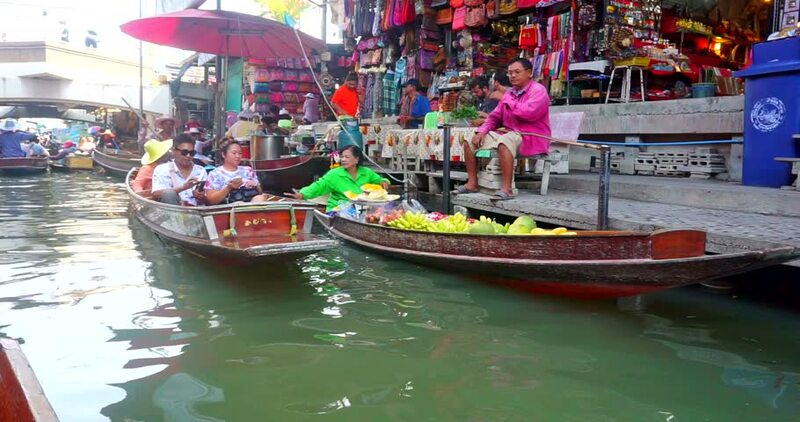 hd00:27RATCHABURI, THAILAND, JULY 15, 2017: Tourists enjoy riding in long tail boats and shopping at the famous Damnoen Saduak Floating Market in Ratchaburi, Thailand. hd00:14GINIGINAMAR, FUERTEVENTURA, CANARY ISLANDS - JULY 16, 2013 - Fiesta del Carmen. Traditional parade of the Virgin Mary with little boats in Giniginamar village. hd00:15MAHARASHTRA, INDIA November 10, 2015: Beautiful landscape of fishing boats parked in river on Are Ware road, November 10, 2015, Ratnagiri, Konkan, Maharashtra, India, Southeast Asia.